Ashampoo Burning Studio 2014 is the upgrade version of Ashampoo Burning Studio 2013 that designed to quickly burn data and file to create CD, DVD and Blu-Ray discs. Ashampoo Burning Studio 2014 provides all the tools that need to create and burn CDs, DVDs and Blu-ray discs (data, audio and video) and offers options for designing disc wallets, creating and managing disc images, erasing rewritable discs and much more. Ashampoo Burning Studio 2014 normally priced at $49.99 per license. As part of promotional offer, Ashampoo is now giving away full version of Ashampoo Burning Studio 2014 for a limited time. Fill in the email address, and then click the Request full version key button as shown in below image. An email from Ashampoo will be sent to registered email address containing with full version license serial key code for Ashampoo Burning Studio 2014. Once finish download, run the installer and install Ashampoo Burning Studio 2014. During the installation process, it will offer to download and install “Advanced Driver Updater”. If this doesn’t suit you then choose “No, thank you” option when it pop-up. Restart the PC and enjoy the program. 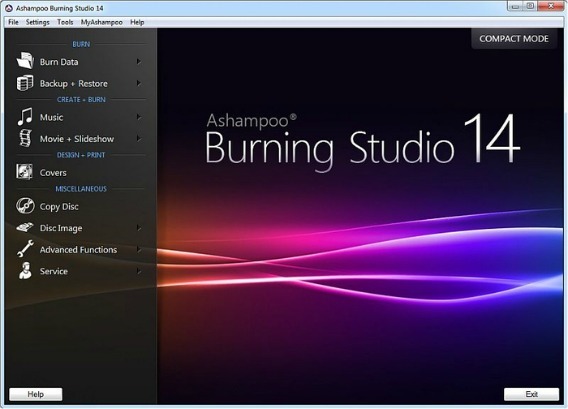 Ashampoo Burning Studio 2014 supports Windows XP, Windows Vista, Windows 7, and Windows 8.